A couple of big thunderstorms recently had put us in the mood for a cozy bowl of chili, but not in the mood for slaving away in the kitchen, if you know what I mean. We wanted to enjoy our cozy bowl of chili while snuggling on the couch watching our new favorite show, Stranger Things. If you haven’t watched it yet – WATCH! If you have – isn’t it awesome?! 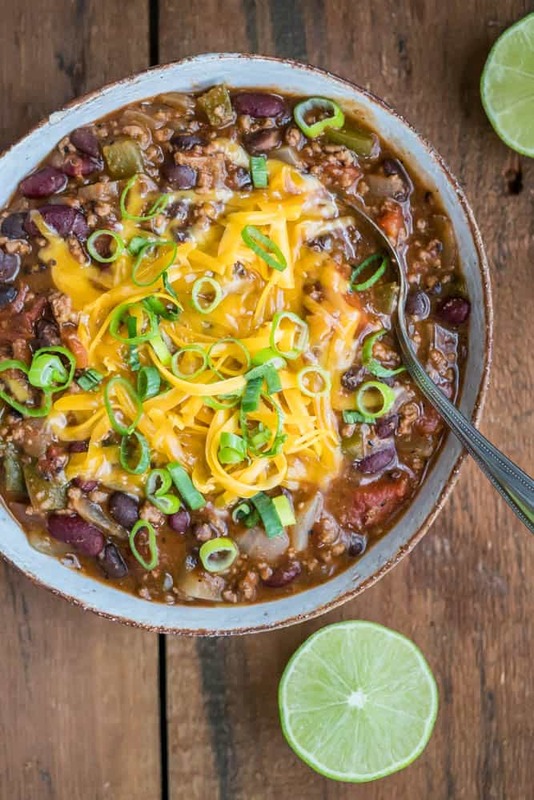 It’s days like these where our Easy Chili recipe comes into play. It’s quick, it’s easy and it’s deeeelicious! While not as fully “whole food” and “fresh” as we like to preach on Living Chirpy, we can all agree that sometimes you just need a quick and easy recipe like this. You know, for those days where you just can’t be bothered to cook, amirite? The good news is that a recipe like this still has plenty of goodness to it and definitely beats binging on fast food – money and health-wise. Lazy days can still be lazy without too much sacrifice. 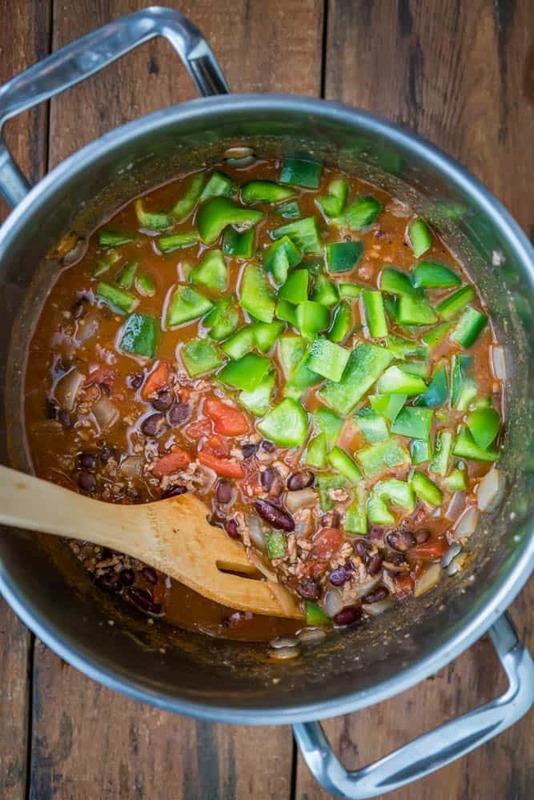 A couple cans of roasted tomatoes, a couple cans of beans, two onions, a green pepper, ground beef, a handful of spices and just a little bit of hands-on time is all you need! A few minutes of stirring, a little bit of waiting while the chili does its magic bubbling away in a pot and then it’s ready to enjoy (but not before adding a little heap of grated cheese and a squirt of fresh lime juice)! If you’re like me and also believe that soup is an all-year thing and not just a fall/winter thing, you’re in luck! We’ve got plenty of yummy soup recipes for you to try out! Brown the ground beef in a large pot over a high heat. Add the onions and cook for a few more minutes until the they start to soften. Add all the rest of the ingredients [do not drain the water from the cans] and bring to a boil. Once boiling, turn down the heat and let it simmer for approximately 45 minutes, longer if you want a denser chili. Note: We like to add the green pepper in halfway through to keep them for getting too soft, but it’s entirely up to you. Pin It! 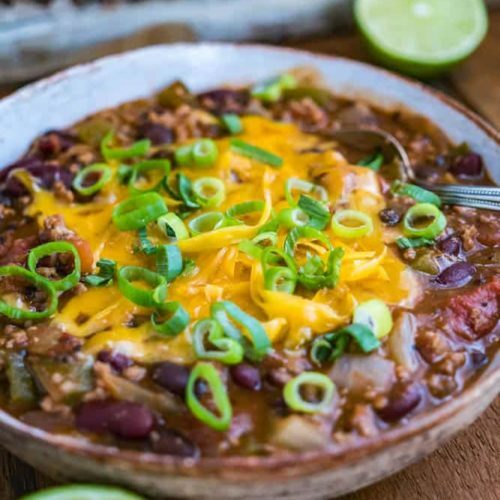 Quick And Easy Chili! Fantastic! Was napping this afternoon and forgot to get a nice dinner together. 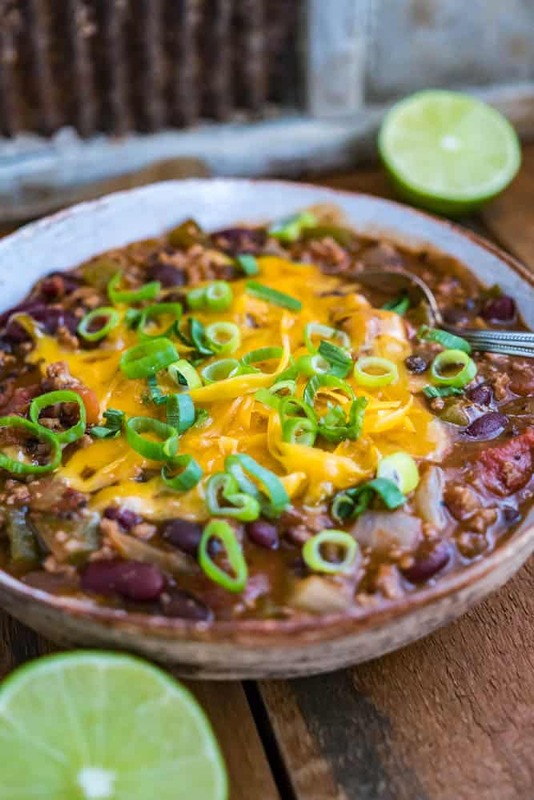 When it snows here we do chili so this was quick, easy and fantastic!